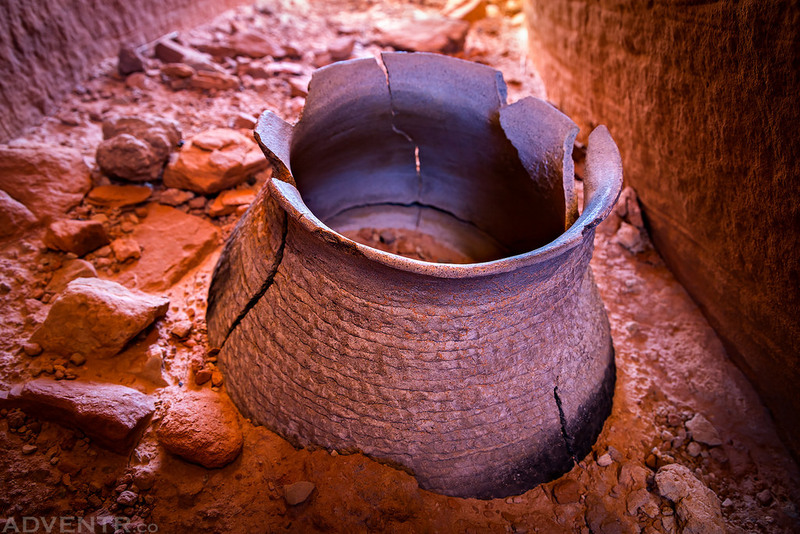 A Mesa Verde Style corrugated pot found in situ within Bears Ears National Monument. Aside from our first Thanksgiving together when we camped at Natural Bridges National Monument, we typically get a hotel room in Blanding because of the long cold nights this time of the year. It turned out that this year was unseasonable warm and it would have been perfect weather for camping had I not already booked a room in advance. It was actually warmer out than I would have preferred for some of our longer hikes. Enjoy a few photos from our long holiday weekend in The Bears Ears! After a long hike we finished the day off by watching the golden light before sunset strike these ruins and then disappear. Driving between the Bears Ears. A closer look at the diamond design. A sunburst over a square kiva. Part of the top of a pot that Diane found. An evening at the base of Comb Ridge. This pictograph is being covered by runoff. More of the Bigfoot Ruins. An evening hike in a Cedar Mesa canyon. Toeprints in the mortar at Bigfoot Ruins. This ruin blended in well with it’s surroundings. Ruins on top of a hill in the middle of the canyon. An old cattle trail we used to get out of a canyon. The remains of a square kiva. The third pot we have visited on Cedar Mesa. Colorful and vibrant reflected light on this interior doorway. You have outdone yourself this time! These are beautiful photos of fantastic sites. Thanks so much for taking the time on your hikes to take these photos and share them!! What treasures to behold! Let’s hope they get saved for future folk to enjoy. Can’t wait to get going myself. Your photos are great and inspirational. Nice work.